Givers know that an ECFA accredited church or nonprofit is complying with all of ECFA’s standards. This enhances the trust of givers and provides more resources for churches and nonprofits to carry out their missions. For these reasons – and more – churches and nonprofits voluntarily apply for accreditation, and once accredited, allow ECFA to hold them accountable to high standards of integrity. The statements reflected below are illustrative of the reasons ECFA accredited organizations value their accreditation. ECFA gives us high standards to attain and creates a culture of transparency and accountability. It makes us better. We deeply appreciate the professionalism combined with the spiritual emphasis that the ECFA brings to us via conferences, phone calls, written material, as well as its onsite and distance reviews! ECFA is of great importance to the evangelical community, as it provides an accrediting agency to which we self-report our financial and fundraising information for review. We believe that the ECFA seal is very important for CRISTA as we work to gain and maintain public respect and confidence in our ministry operations. The initials ECFA are synonymous with quality, accountability, and integrity. We work hard to stay accountable to ECFA because we know the high value placed on being an ECFA member. What a great and informative website ECFA has created! We love the ServantMatch feature. We are excited and proud to be associated with ECFA. We have relied on ECFA for over 20 years. We regularly use the documents in ECFA's Knowledge Center. I keep the ECFA webpage as my homepage and review it daily. We give thanks and praise for the folks at ECFA. God bless you and keep up the good work! LifeChurch.tv’s accreditation by ECFA serves as a clear statement of assurance to our attendees, our donors, and to the public that we conduct Kingdom business with integrity and accountability. Our membership with ECFA provides great value as we implement best practices for nonprofits as recommended by the auditors. Our donors know that we hold to the highest possible standard as we serve in ministry. Our membership provides us the confidence of knowing we have been reviewed by our peers and meet the standards and best practices that should characterize stewards of God’s resources. As we pursue excellence in our mission, it is critical that we seek accountability in our financial matters. Our constituents and donors deserve to know that our integrity, honesty, and stewardship are examined carefully and thoroughly by a third-party. ECFA provides that for us! The Seven Standards of Responsible Stewardship reflect the values of our organization. ECFA membership assures donors that we seek to be good stewards. ECFA is a valued partner in the ministry of Hope Haven. While in the midst of a very busy season of ministry, we had a review by ECFA. The reviewer was most helpful, patiently explaining where we could make improvements in our ministry so that we could steward the resources God provides with excellence. I appreciate the opportunity ECFA provides for organizations such as ours to walk in a responsible measure of accountability to a watching world and to the Christian community. ECFA has helped our global outreach to marriages, families and orphans. We are advocates and partners with a number of ministries and we only consider “partnering” with those ministries that are ECFA members. ECFA brings confidence and increase trust to individuals, donors and ministry leaders. We appreciate not only the accountability of ECFA, but also the resource this organization is to nonprofits. We have learned much from ECFA which allows our ministry to be one of integrity. There has never been a more critical time in the history of the church when the larger public is suspicious of ethical standards practiced by the church. However, being a member of ECFA holds a ministry to the highest ethical standard and accountability. ECFA has served nonprofit organizations as a signature of fiscal credibility for decades. At Cornerstone University we feel both supported and enabled by our longstanding relationship with ECFA and are proud to be an ongoing partner in communicating our commitment to doing God's business God's way. I am pleased that the Church of the Nazarene Global Ministry Center is accredited by ECFA. They provide tools and resources for the general, district, and local church to help us be consistent in our understanding of faithful financial stewardship. Dr. Marilyn J. McCool, General Treasurer, The Church of the Nazarene, Inc. I am continually grateful to the ECFA team for keeping us compliant with the highest standards of financial accountability. Their tireless pursuit of excellence helps all of us better serve Christ and our constituents. When two other area organizations were imploding due to financial accountably issues, the phone rang off the hook with calls from the media wanting to know how we were different. Sharing ECFA standards for accountability with the media allowed Hiway 80 Rescue Mission to show how we were good stewards. French Camp Academy has enjoyed 24 years of membership with ECFA. Placing the ECFA seal on letters and on our website gives our donors assurance and confidence that their contributions are being handled with integrity. Having the ECFA partnership and endorsement is extremely important. We appreciate the oversight and resources of ECFA. Being a member of ECFA assures our members and donors that we do business transparently and with integrity. In a time of scandal and moral bankruptcy, this is imperative! We appreciate the integrity and professionalism of ECFA and are very honored to be a part of this organization. We understand we are stewards of this ministry. As a result we joined the ECFA very early in our history and we strive to maintain their highest standards. I deeply appreciate the role of ECFA in helping both large and small ministries maintain fiscal and operational integrity. As the complexities of government compliance grow, we appreciate the clarity ECFA provides on these matters. Every organization needs a friend who is also an accountability partner when it comes to money and Biblical stewardship. ECFA has been that for me personally, and this ministry too. It is a guard from greed and financial dishonesty, and we all need it. ECFA has become an integral part of our ministry in consistently stretching our mind to new dimensions and deeper values for sound thinking and disciplined action. The role ECFA plays in promoting the highest standards of integrity and responsibility in our financial affairs is invaluable to the Evangelical Presbyterian Church. The ECFA seal assures donors that our records and procedures have been carefully scrutinized, and that we are being fully accountable for responsible stewardship of the resources entrusted to us. This instills con?dence in our mission objectives and execution as we partner together to see people enter the kingdom of God. ECFA is a critical partner to Focus on the Family because we believe that transparency is a healthy attribute in the Christian walk. ECFA provides solid accountability in regard to financial transparency to Focus on the Family and its leadership. The ECFA standards are important to us and our donors—giving confidence to those who invest in our mission. In an age of ethical decline, it’s essential that Christian organizations operate at a high standard. Integrity, reliability, and fiscal trustworthiness! Every Christian leader I know would love to have their nonprofit ministry assessed in such favorable light. Through prayer, strong core values, hard work, solid financial principles, and accountability—this is why ECFA plays such a critical role. ECFA has a high standard of accountability, requires financial transparency and oversight, and has earned a credible reputation for trustworthiness. We share these same values and want to strive to maintain them, both for our church and the watching world. To those considering financial gifts during this season of recovery and rebuilding, the seal of ECFA's excellence and integrity speaks volumes. Thank you for the work you do every day to prepare us for unsuspecting storms. In a world of eroding standards, ECFA sets the bar high. We are blessed by our partnership with ECFA and consider it a vital part of our on-going mission strategy. ECFA is all about doing the Lord’s work in a way that is above reproach. We are grateful to God for ECFA, what they stand for, the help they render, and the high standards of excellence they set. ECFA provides the expertise and resources which our small nonprofit does not have internally. I often hear that our faithful supporters appreciate that we are members of ECFA. What a privilege to be a part of ECFA! Your seal of approval is an important part of moving Hearts in Action to new levels for greater projects and the advancement of the kingdom of God. We look forward to communicating with you for guidance and information. I voraciously read the quarterly newsletter cover to cover to glean new information that will help us serve with greater transparency & trustworthiness. I appreciate the information that helps prepare our ministry for the future. We love having the ECFA seal on our printed materials because it brings assurance to donors. We greatly appreciate the assistance of ECFA in helping our ministry achieve and maintain standards and best practices. We are also grateful for the work ECFA does in representing us on Capitol Hill. ECFA membership is important to CBN because ECFA is the national standard of financial integrity. To ensure accountability and donor confidence, Forest Hill Church became an ECFA accredited church. We rely upon ECFA for guidance and expertise and we encourage other churches to pursue accreditation. Our partnership with ECFA is a great incentive to our donors who give generously because they trust our financial accountability. It gives me great confidence that I am truly protecting the integrity of the ministry and safeguarding the trust put in this organization. Because of our high regard for ECFA, we made a commitment to be an accredited member of this excellent organization. ECFA has provided us with sound guidance of our stewardship of His resources. I am extremely thankful for the services that ECFA provides and highly recommend that every Christian nonprofit become a member. We watch with admiration and applaud the excellence and membership growth ECFA is experiencing under your leadership. We fly the "ECFA flag" proudly at ABHE and promote membership among our colleges as well. Our church joined ECFA because we want to be a part of an organization known for promoting integrity and accountability in churches. We encourage other churches to join and maintain high standards to the glory of God. The significance of ECFA’s ministry to our camp came into clearer focus after I attended the fall regional workshop. Thank you for keeping your ears and eyes open to trends and issues on the national level. The quarterly Focus newsletter is now read with heightened interest and is shared with our board of directors. Accountability and financial transparency are of the utmost importance to us and our donors. ECFA has been our first call for clarity on questions concerning both state and federal laws. We appreciate the accountability they provide for our organization and the credibility they have among our donors and around the world. Being able to display the ECFA symbol on our promotional material gives donors and potential donors an added measure of confidence in our organization. It is a mark of distinction. Displaying the ECFA Seal of Approval enhances our credibility and shows our donors we hold to high standards of accountability and transparency! I encourage all rescue ministries to join ECFA! The Seed Company's ECFA membership speaks volumes to our financial partners. ECFA validates our commitment to God-honoring stewardship — and that breeds trust. ECFA is a partner that helps us improve constantly, a coach that sets a clear standard, and an operational resource that encourages us throughout the year. We are thankful! The standards set by ECFA demonstrate excellence in governance, leadership and finances. The ECFA seal is a visual reminder to our members, guests and the community that Trinity is devoted to accountability and excellence. ECFA is a trusted partner for accountability, information, and advocacy. We became a member because of ECFA's strong reputation of guiding Christian ministries in the area of organizational excellence with Christian commitment. Membership in ECFA is a "Good Housekeeping" seal of approval that our donors, vendors, and friends look for. We belong to ECFA because it is a powerful way to let our donors know that we operate with integrity, accountability and transparency. Having the ECFA seal helps us stay on their list of who they want to support. Our goal is to set a standard that will bring glory to God. ECFA helps us do just that! ECFA’s standards help us to adhere to boundaries and keep us far from crossing the line. A commitment to transparency and accountability results in trust which is foundational to donor and organizational relationship. ECFA helps us build that foundation of trust. 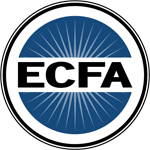 Having the ECFA logo on our letter head signals our commitment to financial accountability. It is an honor to partner with you. Today’s donor values integrity and effectiveness. Our ECFA membership assures our donor that HCJB is accountable. ECFA membership is indispensable to HCJB and puts HCJB in a high caliber network of like-minded ministries that builds trust with our donors.